Conan Cameo For Dolph Lundgren? "I've talked to the producers about doing something for Conan"
He-Man need not go on. Lundgren will also be appearing in the upcoming Sly Stallone-directed mercenary flick, The Expendables, which has the same production team as Conan. He-Man can network. The new Conan is to be directed by Marcus Nispel (who replaced Brett Ratner) and penned by Thomas Dean Donnelly and Joshua Oppenheimer. Nispel helmed Friday the 13th (2009), Pathfinder and several music videos, including "Lullabye [Goodnight, My Angel]" from Billy Joel: Greatest Hits Volume III. Donnelly and Oppenheimer worked together previously penning the scripts for Sahara and Dead of Night. You can peruse Conan's full casting breakdown here to ponder which part Lundgren would play best. In the meantime, a little Dolph Lundgren trivia: the man not only measures in at 6'5'' and 240 lbs, but also holds a master's degree in chemical engineering from the University of Sydney - lest we think someone with that much muscle is short on brains. 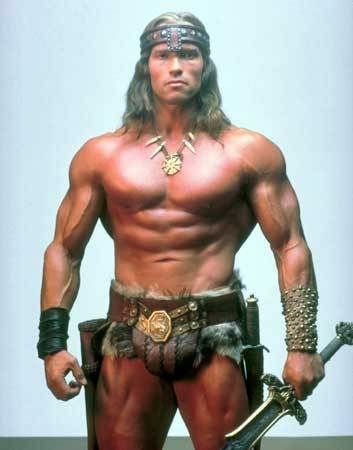 So, how likely do you think it is that this new Conan will be better than 80's Schwarzenegger vehicles? What are the chances the new actor to play Conan will be better than the Governator himself? Conan will be riding into theaters in 2011, undoubtedly shirtless.